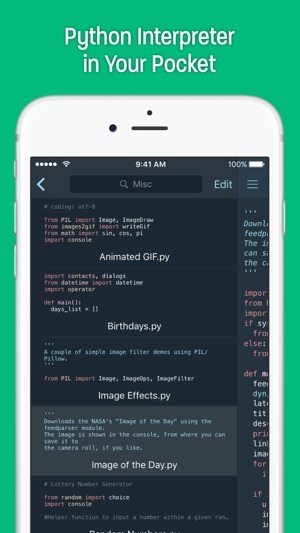 Pythonista is a complete scripting environment for Python, running directly on your iPad or iPhone. It includes support for both Python 3.6 and 2.7, so you can use all the language improvements in Python 3, while still having 2.7 available for backwards compatibility. 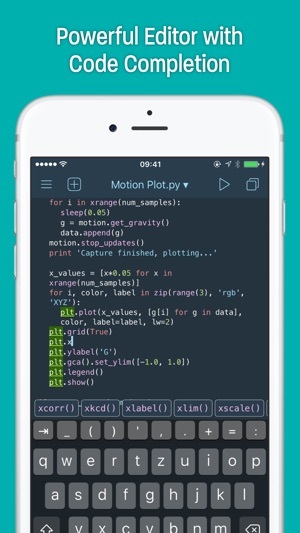 In true Python fashion, batteries are included – from popular third-party modules like numpy, matplotlib, requests, and many more, to modules that are tailor-made for iOS. You can write scripts that access motion sensor data, your photo library, contacts, reminders, the iOS clipboard, and much more. You can also use Pythonista to build interactive multi-touch experiences, custom user interfaces, animations, and 2D games. >>> Lots of other popular third-party modules, e.g. requests, BeautifulSoup, Flask, bottle, SymPy, and more are included. The name "Pythonista" is used with kind permission of the Python Software Foundation. • You can now sync your scripts via iCloud Drive, and open Python files from other apps. 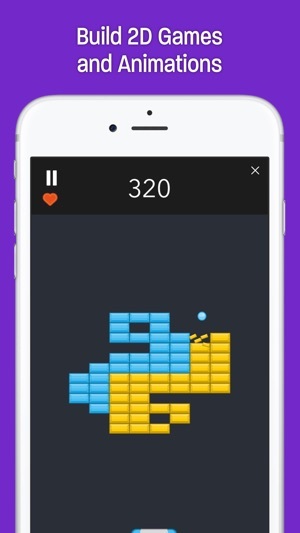 • Pythonista now uses Python 3.6. Among other things, this enables the use of f-strings for easier string formatting. • The "Convert Tabs" feature is now called "Reformat Code", and supports applying coding style guidelines, in addition to converting indentation. • Improved search in the script library and documentation. • Support for drag'n'drop in the script library (requires iOS 11). • Improved support for the iPhone X. 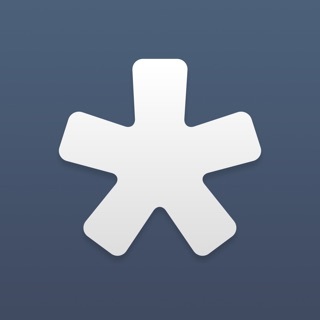 • Unified tab bar UI on iPhone and iPad. • The Python interpreter is now built with IPv6 support (this should fix connectivity issues users were experiencing with some cellular providers). • Various bugfixes and minor improvements – please refer to the release notes page in the in-app documentation for details. I usually don’t write reviews, but I felt compelled to for this gem of an app. I regularly program on the side for fun and automation. I’ve used Pythonista to automate tasks on my phone, prototype programs for my Windows and Linux computers, and built silly games to play for fun. I’ve used Python at work to drastically speed up our workflows by several hours, which has been a life saver and even garnered me a raise. Not only was Pythonista an indispensable tool for prototyping those programs, but it has allowed me the opportunity to improve my skills on the go. There are some limitations I wish didn’t exist, but this is because of Apple, not the developers. 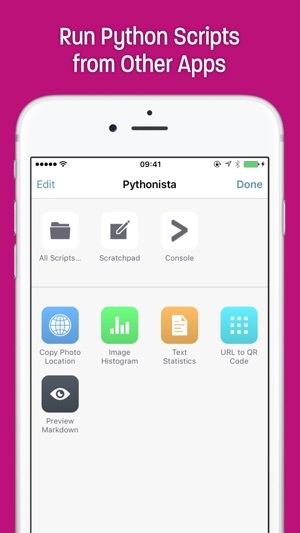 The developers have gone above and beyond to implement extra libraries and integrate Pythonista with iOS. 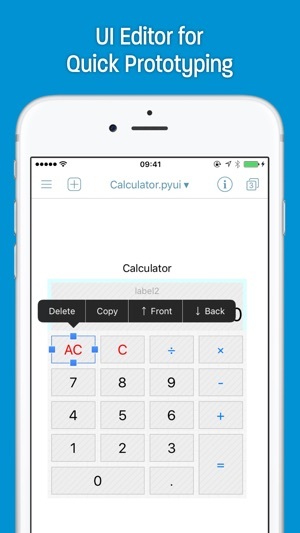 If you’re looking for a good iOS Python app or want to learn Python on the go, I highly recommend this app! This is coming from someone who has been using a MacBook Pro for programming as a main source, and have been using PyCharm previously and also Sublime Text 3 as a text editor. I didn't have too high of hopes for an IDE for mobile (iPad and iPhone) but I clearly changed my opinion. This was the best $10 I have ever spent in my life. It is an amazing tool with so many good features, and a very nice user interface for professional users and even people who are just starting out or hobbyists. I would recommend this application to any person I know, and I would get them to start programming on Pythonista. The lovely thing about this is that you can take it literally everywhere, now that iPhones are in almost every pocket these days, and I think people should take advantage of it and get this app. I <3 the creators of Pythonista!!! Truly a remarkable app with amazing capabilities! As a part-time mobile app developer, full time tinkerer, I write a lot of mobile apps for myself. This used to require a paid developer account and competency in various languages and supporting tools. For myself, most of this madness has been replaced with Pythonista programs. Amongst many features, you get a theme-able editor with syntax highlighting, auto-complete and a built-in debugger, a REPL, and a UI builder. Add the community-developed shell, StaSh, and you get a basic terminal with pip to pull dependencies for your programs. With action sheet support it is trivial to create programs that integrate seamlessly with other iOS apps. Works great with repository management apps like Working Copy.